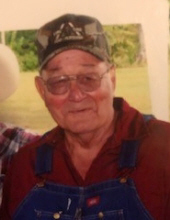 Celebrating the life of Wallace Royce Cogbill, Sr.
Obituary for Wallace Royce Cogbill, Sr.
Wallace Royce Cogbill Sr., 89, of Vidor, TX died Saturday, March 30th, 2019 at his home in Vidor, TX surrounded by his family. He was born in DePort, TX on Feb. 15, 1930. Wallace was a veteran of the 31st Infantry Division of the United States Army. He enjoyed being active in the Vidor VFW Post 8246. He was a respected member of the Sheet Metal Workers International Association local 196 union for more than fifty continued years. Passing his knowledge and talent of this trade to his sons gave him great pride. He was instrumental in forming the Vidor Trail Riders Club and enjoyed spending time with his family working with horses and show animals. His life was dedicated to raising his four sons after the one and only love of his life and wife of 21 years, Mary Jo passed away. He became full time father, caregiver, advice giver, and spent many years corralling four boys, all with various personalities, toward their successful adult lives. He was a hard-working man of integrity which began at a very young age helping provide for his parents and siblings, offering a guiding support to those that he loved. In his spare time he enjoyed cooking, playing dominoes, and gardening. Visitation will be Tuesday, April 2, 2019 beginning at 6:00 p.m. at Memorial Funeral Home of Vidor. Funeral services will be Wednesday, April 3, 2019 at 2:00 p.m. at Memorial Funeral Home with interment to follow at Forest Lawn Memorial Park in Beaumont. Wallace is survived by 4 sons; Wallace Royce Cogbill Jr and his wife Rhonda of Vidor, Jesse Cogbill of Vidor, David Cogbill and his wife Toni of Mauriceville, TX and Steve Cogbill and his wife Kristy of Sulphur, LA. He is also survived by 8 grandchildren; Diana, Eric, Daniel, Aspen, Caleb, Kelsey, Kimberly and Cade, 6 great grandchildren and 1 sister; Samantha Taylor. He was preceded in death by his wife; Mary Jo Cogbill, 1 sister; Freddye Sheffield and 2 brothers; Arthur Benson "Bud" Cogbill and Francis Marion "Bo" Cogbill. To send flowers or a remembrance gift to the family of Wallace Royce Cogbill, Sr., please visit our Tribute Store. "Email Address" would like to share the life celebration of Wallace Royce Cogbill, Sr.. Click on the "link" to go to share a favorite memory or leave a condolence message for the family.